Some o' y'all know that Ol' Backwoods was aimin' to go to that gun show down in Raleigh this past weekend. Yep, I was, but didn't make it, because I was attendin' to other business, namely getting my pantry stocked back up. But a good friend o' mine was about 50 ft away when that guy's shotgun "went off". Y'all know guns don't just "go off"; either the guy was negligent in handling or maintaining his shotgun. 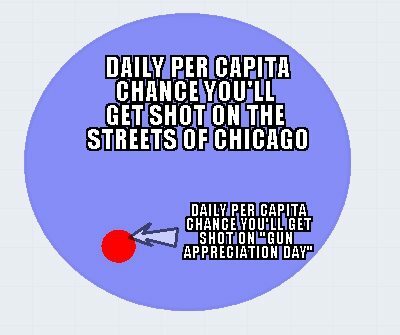 That right there represents a 177 times greater chance of being shot anywhere in Chicago than at a gun show on "Gun Appreciation Day." That is 17,700%, people. 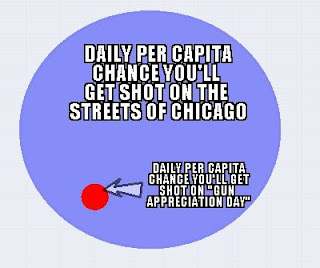 You ain't gonna catch ol' Backwoods disarmed on the streets of Chicago. I ain't never gonna show my face there again.